What challenges and opportunities do financial services marketers face as they strive to improve marketing and brand performance, relevance, value and accountability within their organizations? What challenges and opportunities do financial services marketers face as they strive to improve marketing and brand performance, relevance, value and accountability within their organizations?To help answer this question, McorpCX, a strategic brand and marketing consultancy, surveyed marketing executives from 67 financial services institutions across the USA in the autumn of 2004. The survey grouped responses into several categories, ranging from an understanding of how marketing and brand performance is tracked, to respondents’ views on specific challenges to improve marketing and branding effectiveness. Across all categories, data drove two ‘big‑picture’ conclusions which reveal key strategic issues facing financial services marketers today. First, there is a stated lack of brand and marketing performance information, and an absence of the systems and programmes to track it. Secondly, there is a perceived lack of top‑down organisational understanding of the importance, value and meaning of brand within respondent organisations. Within the overall context of these conclusions, analysis led to a series of key findings, and drove specific recommendations for addressing the issues raised. While the illustrations given are based on data gathered from institutions in the USA, the author’s experience suggests that the conclusions and attendant recommendations can serve as a basis for process and performance improvement in any financial services institution. Brand management and marketing professionals across all industries are joining a move towards greater accountability. Though the official theme at the 94th Annual Association of National Advertisers (USA) meeting in early October of 2004 was ‘Masters of Marketing’, and 11th October, 2004 New York Times article 1 opined it might have been ‘. . . more accurately summarized as Change or Die.”’ Most organisations, including those in the financial services sector, have already increased profits about as much as they can through cost‑cutting. Revenue growth is now a big focus, which means cross‑ and up‑selling existing customers, increasing lifetime customer value and doing a better job acquiring new ones. In short, marketing and brand management is likely to become a distinct competitive advantage much as access, customer relationship management and product quality are viewed today. To better understand these challenges and how they were being addressed, the firm undertook a research project in the autumn of 2004.2 The key objectives were to help create a clear understanding of what respondents believe are the essential components of effective financial services marketing and brand management in today’s environment, as well as the primary obstacles they face in accomplishing their jobs. The survey was conducted with senior marketing executives from a total of 67 financial services institutions in the USA, primarily through one‑to‑one telephone interviews. Survey subjects were ‘Nth selected’ within each segment from a representative database of companies in the banking, 3 insurance and securities 4 sectors of the US financial services market. Among actual survey respondents, however, the banking and insurance sectors were slightly overrepresented (49.3 percent of respondents vs 44 percent of market, 5 and 27.1 percent of respondents vs 20 percent of market, respectively), while the securities industry was underrepresented (15.7 percent of respondents vs 35 percent of market). Respondents were a highly seasoned group of professionals, with the largest group (over 45 percent) boasting over ten years in financial services marketing. Also a very senior group, nearly one‑quarter (23.08 percent) of the respondents were senior vice‑presidents, executive vice-presidents or chief marketing officers of brand, marketing and market research, and just over one‑quarter (26.15 percent) were vice‑presidents in the same areas. Close to 28 percent were at the director level, with the balance being managers and others in advertising, product, research and marketing. Participants represented a mix of financial services businesses, including: retail banking (50.1 percent); commercial banking (48.6 percent); retail credit products (35.7 percent); insurance (27.1 percent); money manager/mutual funds (15.7 percent); and other (7.1 percent). Since the respondent group includes organisations beyond banks and money managers, a ‘total employees’ measure was used to classify size, as opposed to assets under management or deposits. Though the range in total employee size is dramatic, ranging from 49 to over 150,000 employees, 41 percent of the respondent firms had over 5,000 employees. Approximately one‑third of the firms had fewer than 500 employees. Though the data and the conclusions drawn are qualitative in nature, and results vary somewhat by sector, company size, geography and other variables, the author’s experience and analysis gives a high degree of confidence that the aggregate results provide a solid directional indicator of the subjects covered, across the spectrum of financial services firms surveyed. When asked how they would rate the effectiveness of their current overall marketing programmes and their branding initiatives, nearly one‑half of all respondents did not feel as if they were doing a great job in these key areas (see Figure 1); 48.6 percent of all respondents did not feel their marketing campaigns and programmes were effective or very effective, and 50 percent did not feel that the overall effectiveness of their branding initiatives were either effective or extremely effective. Only 14.3 percent of respondents deemed their marketing efforts extremely effective, virtually the same as for branding. An additional 37.1 percent believed their marketing was effective, again nearly identical to branding. Overall, How Effective is your Marketing? Overall, How Effective is your Branding? Though this is a significant jump, it also means that nearly one‑half of all respondents ranked the effectiveness of their marketing programmes as somewhat effective, having limited effectiveness, or not effective at all. During the analysis of survey responses, the author noted the brand and marketing metrics that are currently being tracked versus their perceived importance to respondents. Comparing this to the low scores for perceived brand and marketing programme performance, the indication is that respondents are in an environment where marketing is conducted without funding or commitment (or both) for tracking basic metrics. Without these metrics, most marketers would be hard pressed to answer accurately how effective their programmes are, or to build a defensible position for internal discussions regarding budget priorities. In these findings, the phrase ‘performance gap’ or ‘gap’ has been used to describe what analysis has identified as the gap between respondents’ perceived importance of a particular issue, and how well they believe that they, or their organisation, are actually performing. For instance, if 90 percent of respondents stated that tracking a given metric was ‘very important’ yet only 50 percent of respondents actually did so, the gap would be 40 percent. When asked if they currently track marketing campaigns or programme performance, the majority (82.9 percent) of all respondents said ‘yes’. When asked the same question about branding, however, less than half (47.1 percent) indicated that they tracked the value and/ or performance of their brand. This difference is dramatic, pointing to a wide chasm between how marketing and currently perceived. Though it might be tempting to dismiss the 17.1 percent of respondents who do not track marketing performance, or the 47.1 percent who do not track branding efforts, the average number of employees for firms in the ‘no tracking’ subset ‑ for both brand and marketing is well over 5,000 employees. Including eight firms with more than 50,000 employees that do not track brand, these are not small firms. In aggregate, respondents believe that it is equally important to track marketing (80.27 percent) and brand (81.25 percent) metrics. But the gaps between the importance of tracking these and how consistently they are tracked are significant. Illustrating this, there is a 20.7 percent performance gap between the importance respondents place on marketing‑related metrics (very important or important), versus how often they actually tracked them (always track or usually track). Though significant, this is not as dramatic as the 38.3 percent ‘brand metrics performance gap’. Focusing on developing the systems to close the ‘importance/consistency gap’ within respondent organisations is an easy way to boost both marketing and brand return on investment (ROI). If results are usually tracked, that means that the systems currently exist always to track them. If overall results are not regularly tracked, focusing on a single key measure (such as response rates for marketing, or brand values perceptions for customers) can begin to have a dramatic impact on overall programme assessment. To determine how the results of marketing campaigns are measured, respondents were asked to rate the importance of three basic results metrics. In order of importance to respondents, these included response rates (1), revenue generation (2), and profit generation (3). These are clearly key to the respondent group; 84.3 percent thought tracking response rates was very important or important, while tracking revenue and profits were considered very important or important by 82.6 percent and 73.9 percent, respectively. Yet when asked how consistently these same metrics were tracked, a discrepancy was noted between respondents’ perceived importance versus actually tracking them. The discrepancy is not great, with about a 20 percent average performance gap in the perceived importance of tracking these issues and how often they are actually tracked. But for respondents whose organisations rely on marketing to grow ‑ a number the author believes will increase significantly over the next several years ‑setting baseline metrics through consistent, historical measurement is the only way defensibly and intelligently to invest in marketing programmes, regardless of the type. Applying a similar methodology to understanding what is important to organisations in tracking the management and performance of respondent brands, the results show that even though many respondents see brand‑related metrics as very important, they do not follow through with consistent tracking. The gap between importance of brand metrics and consistency of tracking those metrics is nearly twice that of the marketing metrics gap. The three most important brand tracking metrics, ranked in order of importance by respondents, who stated that these are either very important or important, are: customer experience (1), customer retention (2), and customer loyalty (3). But even though these are also the most consistently tracked of the brand metrics, the performance gap is significant: an average of 33.23 percent across these key metrics. The process of defining a brand and effectively communicating what it stands for to all internal and external audiences can be a challenge for even the most sophisticated organisations. But there are a series of definable, measurable building blocks, or ‘components’, that drive brand adoption and understanding across virtually all industries, including financial services. 6 Things like brand promise, customer experience, visual brand delivery, and management’s understanding of brand. In this survey, respondents were asked to review some of the most common components through the lens of their importance in accomplishing branding objectives. Then, respondents were asked to rate organisational performance in delivering on these key areas. What was found points to the need for profound consideration from the marketing department up through the executive suite. (See Figure 2.) Overall, 91 percent of all respondents rated these components, in aggregate, as either very important or important to the development of an effective brand. Yet just 51.4 percent believe that their organisations are either doing very well or well in these key areas. The nearly 40 percent ‘performance gap’ between the stated importance of these branding components and actual performance is significant. Imagine if a financial services firm missed projected revenue targets by 40 percent. The results would be dramatic and instantaneous. In the author’s experience, the results of this gap have the potential to be just as dramatic, though they will not be as immediately noticeable. Since metrics related to brand are not uniformly tracked, negative ramifications of this gap will be attributed to other areas, such as customer attrition, increased competition and market forces. The most telling gap occurs in the top three issues rated as most important. From the respondents’ point of view, the most important thing they can have to support effective branding efforts is management’s understanding of the importance of brand (98.6 percent rated this as either very important or important.) Yet only just over half of respondents (52.9 percent) believe they are either doing very well or well in this area. While not within the scope of this survey, this could affect marketers’ morale, performance and job satisfaction, and lead to increased attrition of marketing talent. When it comes to rating the alignment between customer experience and brand promise, the scores for the entire survey group were 98.5 percent for importance and 54.4 percent for performance, representing a 44 percent performance gap. Rounding out the top three, a clearly defined brand promise boasts a less dramatic (but still su3stantial) performance gap of 35.7 percent. When looking at those areas that marketing executives noted could substantially improve the effectiveness of their marketing and branding programmes, better internal buy‑in and communication between stakeholders tops the list, which is not surprising given the performance gaps uncovered between the importance of both management and staff understanding of the brand and how well organisations perform on this measure. (See Figure 3.) Closely behind the internal buy‑in issue, marketing executives are looking for a better understanding of the customer and competitive environment, with a focus on what customers think, need and feel. Interestingly, this desire ties directly in to numbers six and nine on the Top 10 list, an interest in learning more about (their) customer touchpoints,7 and the customer relationship lifecycle. 8 Of course, by understanding these, marketers gain a clear understanding of the needs, barriers and levers to movement ‑ and the interrelationships between each that consistently and predictably can drive customers closer to financial services organisations. Figure 4 How big a challenge are these to overall marketing and brand effectiveness? Specifically, when ranked by both substantial and moderate challenge responses, the greatest challenge is finding ways to track brand value and equity (56.9 percent) followed by ways to get more accurate customer value data, such as lifetime customer value and other related measures (54.7 percent), and setting better ROT and performance measurements, including ways to define and measure programme success (48.4 percent). When ranked by substantial challenge alone the top issues remain substantially the same. These results are painfully indicated in the overall low scores marketers are giving themselves and their organisations when asked to rate their overall brand and marketing performance. It is also fairly consistent with the respondent group of about 50 percent who are comparatively dissatisfied with their performance against several different brand and marketing success measures. On the one hand, financial services marketers lack key information about customers, brand, and marketing campaign and programme success. They also feel they lack information about touchpoint efficacy, competition, customer value and customer relationships. But their organisations lack information, too. First, about the efficacy of marketing: Is it working? Is the ROT defensible and measurable? Secondly, organisations do not understand the importance of brand. According to respondents, neither senior management nor staff really understand or appreciate the importance of a strong corporate brand. In general, the survey group understands what should be done to increase the efficacy of marketing and brand management programmes, acknowledging that varying degrees of help are needed from both internal and external sources. What seems to frustrate respondents is the gap between their perception of the importance of marketing and branding best practices, and their firm’s actual performance in these key areas. The data clearly support this, with dramatic gaps between perceived importance and implementation success. Having said this, it appears that some of this pain is self‑inflicted, as initiatives to measure and quantify the efficacy and value of these programmes get relegated to low, or no priority, in spite of their stated importance. First is the day‑to‑day challenge of how to improve continually the efficacy of strategic and tactical marketing, branding and customer relationship initiatives. Second is how to overcome direct and indirect barriers to measuring, funding and implementing marketing and branding best‑practices programmes. Ignoring the regular and consistent gathering of data and their subsequent analysis make it very difficult to defend the efficacy of marketing initiatives, programmes or departments, much less increase internal support for and understanding of the importance of brand and marketing initiatives. Ultimately, the author believes that those financial services firms that continue to underperform in these areas will see increased competitive pressure and a loss of strategic advantage, leading to a decrease in valuation over time. Just as with financial performance, measurement is critical to improvement for marketing and brand initiatives.9 Creating a culture of measurement‑driven marketing will help executives understand better how to derive the greatest return from their investments. And moving past the fundamental first step of understanding that brands do have inherent value, 10 a measurement‑driven brand management culture will maximise the brand’s effect on tangible business results in critical areas including customer experience, retention, loyalty, profitability and value. Moving into these areas in an incremental manner will begin to provide marketers with the baseline data to pursue key management support as well. For example, the ability to quantify gaps in organisational alignment behind the brand, or discontinuity in the customer experience, can have a profound impact at the executive level. These can also be relatively simple programmes to implement. The author believes that the opportunities for those organisations that are first to focus on and invest in these processes are significant. They will quickly see a measurable increase in the efficacy and ROl of their marketing dollars, understand their customers better and have a better understanding than their competitors of how to differentiate their companies, and gain mind, market and wallet share as a result. Organisations must also begin bridging the functional gaps between marketing and finance, providing marketers with the ability to analyse better and improve brand and marketing performance. At the same time, the ‘language of analytics’ is spoken and understood by nearly everyone in the executive suite, providing a common framework for assessing marketing and brand‑related investments. Move towards a culture that applies a rigour and accountability to measuring brand and marketing performance similar to that currently applied to financial performance. Is there an overall philosophy of encouraging and rewarding performance? How does marketing specifically support the CEO’s agenda, and deliver the results to support his or her strategic objectives? Whose ‘agenda’ is marketing tasked with pursuing? Are there any informational barriers between the marketing department and the CEO suite? Has leadership in the organisation begun thinking about the benefits of tracking brand and marketing performance, and being able to improve this performance over time as a result? Identify, and take steps to close any internal brand performance gaps between management’s vision and the organisation’s internal culture. Does management have a coherent vision for the organisation, and is it embodied in a believable brand promise? Is that vision shared by employees, who deliver on that promise to customers through the multiple touchpoints across the customer relationship lifecycle? Are there systems in place to measure the congruence between management’s vision for the organisation and what employees believe to be true? Understand the gaps in customers’ brand experience, and work with employees to close them. Does the brand accurately reflect the relationship an organisation’s customers feel they have with it? Do employees deliver the brand in the same way customers feel about it? Do market perceptions and the brand promise match the brand experience across all touchpoints? Develop a brand and marketing performance measurement strategy, and apply it consistently over time. Would a better understanding of what a ‘performance dashboard’ might look like help the organisation plan for a measurement strategy? Does the organisation track some of its marketing programmes consistently? If so, develop a strategy to track all recurring programmes by the same set of performance metrics. Has the organisation considered the potential intersections of brand and marketing measurement programmes through quantitative customer research? Compare, understand and track the organisation’s brand within the context of its competitive marketspace. Does the organisation know how its customers perceive its brand, and the brands of its primary competitors? Is the brand ‘positioned’ in a way that sets the organisation apart from its competition, and which is both relevant and believable to its customers? Develop a thorough understanding of all customer touchpoints across the entire customer relationship lifecycle (CRL). Does the organisation have an understanding of the sequence and impact of all audience touchpoints communications, physical, phone, internet and how they affect the customer’s experience with its brand? Does the organisation understand the customer relationship lifecycles unique to the various segments of its business? Is the organisation aware of the barriers to progress for prospects and customers as they move through the various stages of the CRL? What are their needs at different phases of the CRL, and how is the sequence and delivery of touchpoints (interactive, personal, communications, etc) structured to address them? Ensure consistent implementation of the visual and verbal elements of the brand identity through careful oversight, and with the help of technology. How closely is the creation of marketing and brand delivery touchpoints monitored throughout the organisation? Does marketing manage the unified delivery of a consistent visual and verbal brand experience across all media? Is internet technology utilised to keep brand assets current, while ensuring controlled, secure access to digital and brand assets and delivery of graphic standards? Take some simple steps to increase the speed of deployment and the efficacy of the brand and marketing processes. How do the various members of the team currently keep up to date on progress in strategy, concept, production and deployment of research, marketing or brand‑related programmes? Are there systems in place that allow team members to review and assess quickly the components, status, costs and results of any single programme, regardless of who (internally or externally) is managing it? Are standard operating procedures and best practices in the development and management of marketing programmes captured, codified and propagated? Could automating the management and follow‑through on these programmes give more control and faster cycle time from marketing through to results from branch or business development staff? Systematise the gathering of customer opinion, experience and needs information to ensure more accurate data upon which to base brand and marketing decisions. Are customer listening tools in place? Is the information gathered through marketing communications programmes utilised? Does the organisation know what a loyal customer looks like? Does the organisation know why it loses customers? Does it lose any customers it wants to keep? Make the right brand and marketing investments in the right customers: not all customers are created equal. Does the organisation intimately understand the various financial and satisfaction metrics associated with each of its audience segments? If so, does it utilise this knowledge to ‘scale’ marketing, brand and customer service delivery investments in a way that meets customer needs, while ensuring an acceptable ROT? If the organisation does not have this information, are there initiatives or programmes under way to begin connecting customer profit and metrics with marketing programme performance? Is the concept of ‘customer lifetime value’11 something that is discussed within the organisation? 1 Elliott, S. (2004) ‘At their convention, the “Masters of Marketing” hear urgent talk about shedding what’s obsolete’, The New York Times, 11th October, Section C, p. 10 , Col. 5. 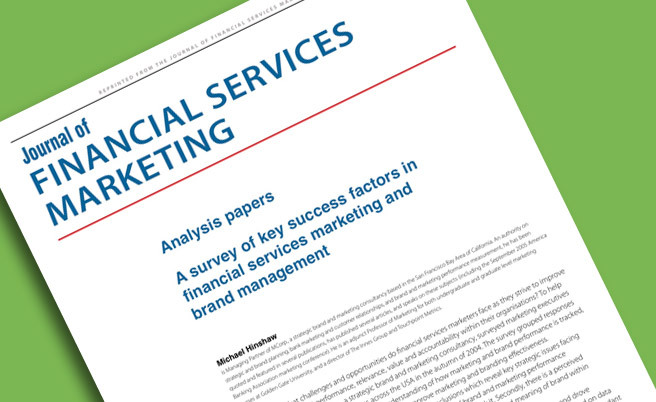 2 Hinshaw, M. C. and della Santina, D. (2004) ‘Survey on financial services marketing and brand management conducted among marketing executives from 67 financial services institutions in the United States, Fall 2004’. Published in February, 2005. 3 Banking institutions include commercial banking and savings institutions, credit unions, bank personal trusts and estates. 4 Securities include mutual and closed end funds, and MCorp. securities broker/dealers. 5 Market share data based on total assets of financial services Sector by Industry, end of year 2004, Insurance Information Institute and the Board of Governors of the Federal Reserve System. 6 Executive Summary of ‘A Survey of Best Practices in Brand Management Today’ (2002) PowerPoint by Prophet. 7 Brigman, H. (2004), ‘Touchpoint Mapping Improve Customer Experiences and Relationships University, USA. Through Touchpoint Optimization’, White paper, Touchpoint Metrics, March 2004. 8 Hinshaw, M. and Brigman, H. (2003) ‘Marketing Touchpoints and the Customer Relationship Lifecycle’, White paper, Touchpoint Metrics and MCorp. 9 Srivastava, R. (Emory University) and Reibsteiun, D. J. (The Wharton School) (2004) ‘Metrics for Linking Marketing to Financial Performance’, Working paper submitted to the Marketing Science Institute, 19th October. 11 Ofek, E. (2002) ‘Customer Profitability and Lifetime Value’, Harvard Business School Publishing, USA.